If you, a family member or friend is eligible for the Congressional Gold Medal and you can go to the San Jose ceremony, PLEASE register by 11/16/11! They are looking for WW II veterans who served in the 100th / 442nd or MIS. Medal ceremony and associated events on November 2, 2011 in Washington, D.C.
We’re pleased to announce our new Twitter presence. Follow @SomeKindofAsian! Details of an upcoming promotional contest coming soon… ooh la la! WordPress is whack and won’t let us put a “like” buttons straight on our site, but connect with us on Facebook to get all of the latest updates on the thing you check as soon as you wake up and right before you sleep. P.S. Thanks to Thomas Tan for designing our beautiful logo! He’s currently working on designing a header for us as well. Check out his portfolio and his blog about fight films! I’m not sure if it’s exactly a fundraiser, but it does involve a toy drive. All the toys from the toy drive will go toward the Asian Youth Center. According to GAPSN, “All toy donations will benefit underprivileged children/youth at Asian Youth Center, a nonprofit agency serving the social service needs of Asian immigrant families.” Plus, there will be hors d’oeuvres, pasta dinner, raffles, and a bachelor auction, along with admission to Micky’s for the rest of the night after the ball. Hey, who doesn’t wanna give toys to little kids? Last night, Sheena and I went to the TAYO Literary Magazine Release Party, where the 2nd annual edition of this magazine, whose aim is “bringing the Filipino-American community together through the arts. We empower Filipino-Americans through creative forms of expression, such as poetry, essays, photography, paintings and drawings.” (from their website) They also accept work from non-Filipinos/Filipino Americans. It was really cool! People there were really nice and stuff. The print magazine looks really nice, and the writing and artwork they chose is nothing less than amazing. They also published other works on their online edition. The print magazine is only $10 plus shipping and handling. It’s a really great cause. Check it out!!! Sheena! She’s one of Eileen’s and my closest friends from high school, and we’re so happy to have her on board. She’s well connected to the South Asian community, but she will also be contributing eeeverything she hears of. The more eyes and ears we have about town, the better. Sorry if it looks like that’s all we care about! As I mention on the “About” page, it’s just that I’m a double major in Philippine Studies and Theater, so naturally, those are the events that I am already aware about. However, we are interested in Pan-Asian events and things that are not just theater! So if you’re aware of any other events or want us to post on anything else, please please let us know! We need eyes and ears everywhere, so any help we could get would be fantastic. 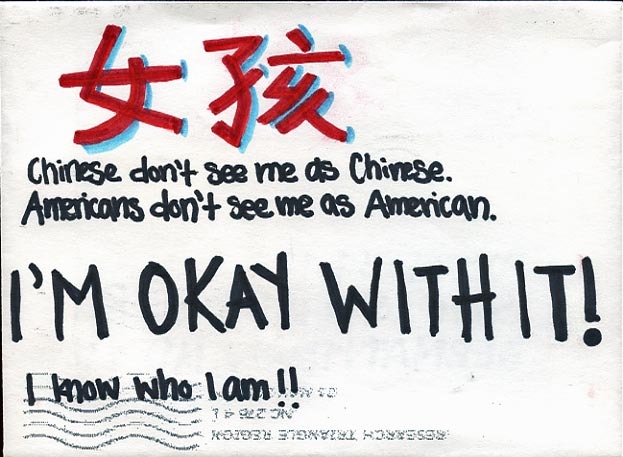 I just looked at Postsecret this morning and saw the perfect postcard to encourage Asian Americans who sometimes feel like they don’t belong in either their Asian culture or their American culture. Check it out!